The phylogenetic relationship between Ephemeroptera (mayflies) and Odonata (dragonflies and damselflies) remains hotly debated in the insect evolution community. We sequenced the complete mitochondrial genome of Caenis sp. (Ephemeroptera: Caenidae) to discuss the phylogenetic relationship of Palaeoptera. 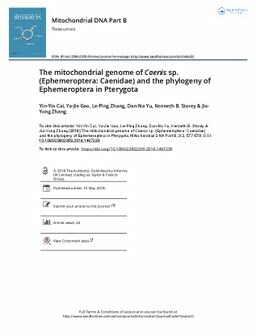 The mitochondrial genome of Caenis sp. is a circular molecule of 15,254 bp in length containing 37 genes (13 protein-coding genes, 22 tRNAs, and 2 rRNAs), which showed the typical insect mitochondrial gene arrangement. In BI and ML phylogenetic trees using 71 species of 12 orders, our results support the Ephemeroptera as the basal group of winged insects.